NOTE--- If size is not listed, it is a standard 4/5qt or 750ML decanter. Please contact me about any questions on the list or for pictures (If the decanter is in my collection). Production numbers, if available, are listed. -"Mini" 1/10th pt King Tut filled with "Michter's Liqueur"
-NOTE-1976 Bells were available in a special yellow box with parchment paper note. -NOTE-Standard sizes not listed. Only special editions. Great news! Existence of the Arkansas Football on a tee decanter is confirmed! I now have one in the collection. A big thanks to Scott! Secondly, some variations of the Hex decanter have been discovered! I found Hex decanters with a 750ML sticker over the 4/5qt designation on the ceramic top and also a third variation where the Michter's logo is on the top (instead of the side) of the ceramic top. ---The Amish Buggy was originally released WITHOUT a horse. It came with 2 leads, but no horse. The horse was released at a later date. Furthermore, a wooden display panel was then released after that. ---The existence of the USC Football is debatable. After reviewing my price lists, I found only 1 mention of the USC Football and it claims it was made in over 1,900 units- which would place it at the same production level as the PA Football. The PA Football mysteriously is missing from the list. Therefore, I am suspecting that the USC=PA and was a typo. I am still searching for evidence otherwise though. ---Not all Gold Pot Stills were destroyed. Recently, a box of unsold but empty Gold Pot Stills was found. This box, as confirmed by the owner, was auctioned off at the Michter's sale in 1996. 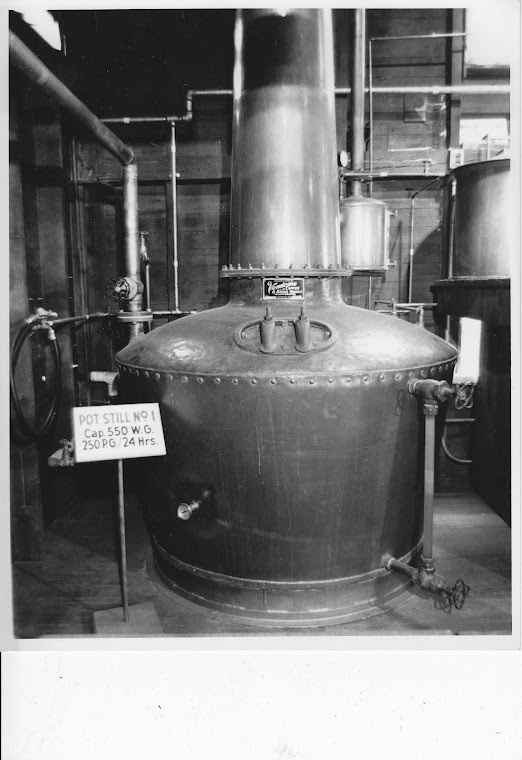 -The brown/copper 86 proof pot still does exist after all. I have one heading my way right now. -Some Series A quart jugs are erroneously labeled "Series B" on the rear. When collecting the jugs, I strongly recommend using the date and front graphic to identify series. The original green-front series is not dated. Series A was 1970, Series B (which looks similar to Series A) was 1976, and Series C was 1978. Ran across a few decanters at Union Canal days this past weekend. I found the Reading Pagoda one to be particularly interesting. 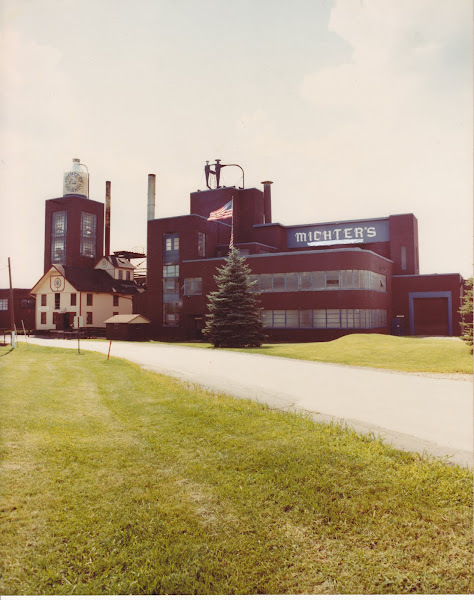 Michter's did a lot of local landmarks or historical pieces- The Pagoda, a canal boat, a Conestoga wagon, the Liberty bell, and a few others. Did you buy any decanters? I can assure you the USC football does exist. Might not be many out there but there are some in collections. Just as the Christmas tree with a star instead of the angel. These items are only in advanced collections. That is correct. I have photos of those decanters, along with many other prototype Michter's decanters that are in several different private collections. Every week I find more stuff! Missed the Tut comment. As for values, I wrote a separate blog entry on what Michter's decanters are worth. Assigning value to them is very difficult. I can tell you that the Tut, Nefertiti, and Selket decanters are common in any size. Right now decanters don't seem to be fetching much in price, so you could see maybe $10-$30 each, but that's about it. I have a Michter's whiskey decnter that commemorates the lst gambling casino on the east coast by Resorts Intl on 5/26/1978. How can I find out what it is worth? I'm assuming this is the email I just received about the same decanter. I sent you some information on it that will hopefully answer you questions. Thanks! Today my son bought a 1977 Reading Pagoda Decanter and we were hoping you could tell us what it may be worth. Thank you. I just bought 2 Reading Pagoda's on ebay, I know I paid to much, $27&$30 but I'm OK with that I really wanted them, I'm not a collector, I grow up in Reading. My question is, the tax stamp/labals are still on both of them, is there any good reason not to take them off or should they be left on. That's entirely up to you. I like to leave them on just because to me it makes the piece look complete. But for display, it really doesn't matter. You wouldn't be harming the value in any way if they are already empty. As for your purchase price, the value is what you see in it. If you're partial to Reading, then those decanters are worth every penny of that price to you. Trust me when I say I've waaaay overpaid for a few decanters in my collection, but it was stuff I just had to have or was very partial to. If you find something you want, the time to buy is when it's in front of you! That is one of several decanters Michter's did based on local landmarks or history. It's probably one of the more unique decanters as well. However, it was fairly widely distributed and sold well- making it a common piece. Seems the average going rate for them as of late is about $15 empty to $25 full with a box. It does, however, make a GREAT display piece since it's pretty flat and stout in shape. I just bought a 1914 Chevy decanter by ASI today. I was hoping you could tell me what it might be worth or a little history behind the model. It's missing a few things on it but over all good condition. Got it for $18. Good price! The Chevy is one of the rarer decanters and probably one of the nicest. It's very detailed and displays really well. Michter's, like many distillers of the day (Late 70's) used the ASI models to sell their alcohol. Michter's had the Chevy, 2 different color Cadillacs, 3 different Ford trucks, and 2 different Packards all made by ASI. I have almost all of them and they certainly do take up a lot of shelf space! The Chevy, in good condition will generally sell from $40-$60. Add a few bucks if it's still full or in the original box. Even with missing a few parts, $18 is absolutely reasonable. It may take a while, but you should be able to find another damaged Chevy to take parts off of to complete yours! Full, about $35. Empty, about $25. The decanter market is really down right now. My Father was a member of the Michter's Internatinal Collectors' Society and collected the Goddess Selket, King Tutankhamun and Queen Nefertiti about 1980. Could you tell me what they are worth and where I might be able to sell them? Thank you for your time. I have a 1978 Michter's Stage Coach, 4/5 qt, unopened, with box. It says 1 of 3600 on the bottom. What's its value? That is a fairly common decanter, but being full does add some value. I would say $15-$20. Do you know the value of the Pennsylvania Keystone State shaped Michter"s decanter? I don't see it on your list? It's there, under "Everything Else." While it's a fairly common decanter, you don't seem to see a whole lot of them out there. For some reason, It's one of my personal favorite Michter's decanters. I think it's because it displays well and doesn't take up much space. It just looks cool! As for a value, they still run pretty cheap, think $10 empty without a box up to $40 to full with a box. I emailed you, email still good ?? I did just receive an email asking about a decanter, so yes! I have a square bottom and square top plain beige decanter 86 proof 4/5 quart that I cannot locate anywhere. All it has is the Michters Whiskey Pot Still on the square top. Any ideas? Not much to say here. If you read the blog, you can piece together a pretty good idea of who I am and what I do.